This year the Bainbridge School’s Foundation has pledged a million dollars to help bridge the gap. The best way to describe what the Bainbridge Schools Foundation does is – bridge the gap. They bridge the gap between state funding and the amount of money really needed to run a school – and run it well. 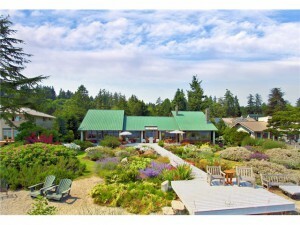 Since 2006 BSF has been working hard to raise money to keep the educational standards high on Bainbridge Island. As a community, Bainbridge Island has not allowed the state budget cuts to compromise our school quality. This year alone, BSF has pledged 1 million dollars to the district. With that million dollars, the district was able to hire back nine teacher who were laid off, continue a high level of teacher training, implement the STEM program, fund classroom grants . . . and more. 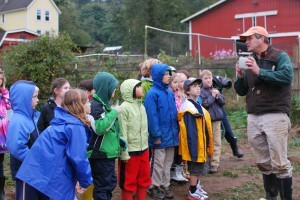 Blakely Elementary Students learn about farming at HeyDay Farms on Bainbridge Island. All around our state and country school districts are being hit hard by dramatic budget cuts. It is a sad and sobering thought to think that my own children are attending school in some of the most economically challenging times in our century. And, I do not see things changing much in the next decade when my own children will be attending middle and high school. Things I used to take for granted when I taught back in the 90’s like copy paper or after school homework clubs are now a luxury. We moved to Bainbridge Island because it was not ok for our kids to have a sub-par education because of bad economic timing. And a huge part of why Bainbridge Island’s schools continue to be strong comes from the support of BSF. Hiring back teachers keeps the class sizes small. Funding teacher grants keeps clubs like the Chess Club and Rocket Club alive – and basic supplies like paper and pencils in the classroom. Funding technology programs keeps teachers trained and crucial technology present and up to date. We are very fortunate that island residents, even those without kids in the school district, support the BSF, year after year. We all see the value of a smart, well educated island community. Inspiring Minds from Vignette Creative on Vimeo. One of the major fundraisers for the foundation each year is the Gala Dinner. It was held about a week ago on January 21st. This year the auction dinner raised $360,000 for our schools – cheers to the foundation for another great event. Vignette Creative produced this inspiring video, which debuted at the dinner. It was truly moving to see my kid’s hard working teachers on the big screen. The video is very well done – take a peek inside our schools. Spring, when many sellers will put their homes in the market, is just around the corner. I have several buyers putting their homes on the market right now in states, far, far away. They are preparing for their relocation to Bainbridge Island. These buyers often inquire about the PROCESS. The process of timing and orchestrating the sale, and then the purchase, and then the move. Some folks buy first, then sell. But many, perhaps most clients, will sell their current home first and then buy and then move. As I recall my relocation story, it brings up the important point that the sale is not only about the offer amount or the number, but also about the TIMING. When we put our house on the market on May 15th we had not bought a house yet. But, my husband was already working in Seattle and subletting a house near UW (that I never even saw, btw). 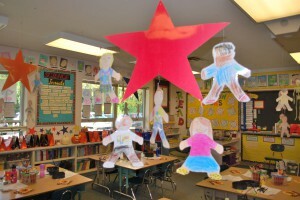 I had stayed behind in Sacramento to button up things at work and let the kids finish the school year. My lofty goal was to be in Seattle by the end of summer. In a ideal, get super lucky scenario, by the 4th of July (because the 4th of July Parade is so great on Bainbridge). We priced our home pretty aggressively. We took the price opinions of the agents in my office and priced it about $20k less (I was an agent in CA too). We were really LUCKY and got an offer the first weekend. We sold our house for $5k less than asking with two other offers waiting in the wings. Our buyer was very easy to deal with, which is whey we chose her. It was not all about the sales price for us. We looked at who could close first, who would likely have no issue with financing, and who would be sane to deal with during an inspection. After we had our inspection and negotiated the repairs (we did about $2k in repairs related to termite damage under the house) the inspection contingency was removed. At that point it was possible to buy a house contingent on ours CLOSING. Not contingent on SELLING. Big difference. We already had our buyer in escrow. A Contingent Sale means your house is still Active on the market and you are still looking for and needing a buyer. After our inspection hoopla was over I flew up to Bainbridge for a weekend, looked at lots of houses (18 to be exact) and picked one. That was the end of May – I mention the timing because the inventory was high, the selection was pretty good. 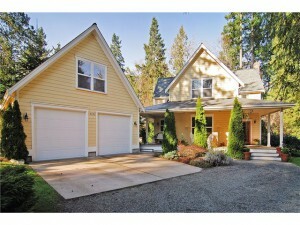 We closed on our house the 25th of June in CA and then had the funds to close on the 26th in Bainbridge. Closings can be done, in some cases, the same day – called a simultaneous close. We had packed our stuff onto the big moving truck on the 20th and it took 7 days to get up to WA from CA. Living out of boxes was not my idea of a vacation. During the week that everything we owned was on a moving truck I stayed with my parents in CA. The kids and I lived out of suitcases like we were on vacation. I was in the same city and working at the same office, but I have to admit that time was the hardest and most emotional week for me. My house was sold, but I was living just minutes away at my parent’s house trying desperatley to imagine what my new life was going to look like. A hard limbo spot. 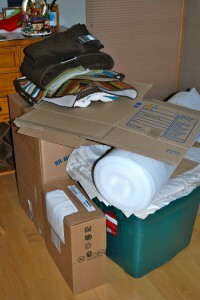 But things were much better once we got to the other side and started the great unpacking and settling-in stage. My husband met the movers on the 27th and started the big unload. We flew up the next day. The rest . . . a new roof, removal of three walls, new paint in and out, the remodeling of a kitchen and three bathrooms, the construction of a new fence, five garden beds, a chicken coop, and a deck . . . are history. The new studio is almost history too (the studio construction will be covered in a blog post at some point this year where I will also explain why we almost, but didn’t move last summer). During our relocation to Bainbridge a lot of things fell nicely into place for us, some by chance, but a lot by rigorous planning. We did have an agent up here as our buyer’s agent and of course we had inspections and negotiations on our new house. Even though I too was an agent I valued our local agent’s insight about neighborhoods and island ins and outs. Our agent helped us make a smart, good decision about where on the island to buy. As we say in real estate – location, location, location. We made it to Bainbridge Island by the 4th of July. We look back and think maybe we could have gotten $20k more out of our old house, but I really could not have handled working full time and being a single parent in CA while my husband was relaxing up in Seattle (just kidding). We could have played our interested buyers off each other, been cocky sellers. But having been in the biz I have seen that backfire many times. Sellers end up selling for much less than they were offered by their first potential buyer. And now, we are happily on the other side, making Bainbridge home. We attained our goal and that was huge and meaningful for our family. And even though the dominoes fell into place, the experience was still challenging and emotional. On that 4th of July weekend our friends from Olympia came up to visit. They had moved up to Olympia from CA a few years ahead of us. They toasted us for being brave enough to take the leap – go after our goals. And looking back I feel like we did do something a lot of folks don’t do because it simply is not easy. After running my first 10K I remember hearing someone say less than 1% of the American population can run a mile. I sort of feel like we ran our marathon. Things were ok for us in Sacramento, life was easy. Change is hard. 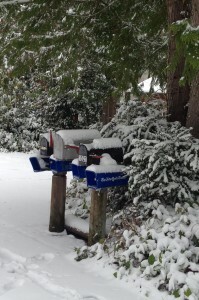 We knew Bainbridge would be better in the long run, but relocation is not easy, it is work. But, now, past the finish line, we look over our shoulders and feel a huge sense of accomplishment that we made this move for our family. We did the hard work to change course; we live in a better community, our kids are in a better school system, and most importantly . . we commute on ferry boats instead of freeways. The radical shift in the real estate market we were hoping for in 2011 never arrived. As real estate agents we entered last year full of optimism and hope that 2011 would usher in numbers far different from what we saw in 2010. But, by the second quarter we realized there were not going to be any major positive shifts in our real estate market. We rebounded a bit in the third quarter and the fourth was slightly better than the same period in 2010. But, overall, a pretty steady repeat of 2010, with home prices dropping even more. In the end, the market mirrored its actions of the past few years, going up and down without ever really hitting its stride. The number of homes sold has increased each year since the 2008 trough (which is good news), but we are not seeing numbers anywhere close to where we were a decade ago . . . nor are we likely to for another decade. 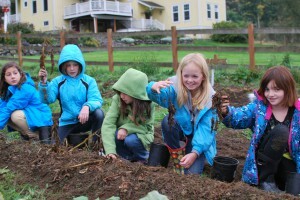 Blakely Elementary Students harvesting potatoes at HeyDay Farms. The potatoes were used in school lunches throughout the district. Even though the number of homes sold has not changed much, there are a number of profound shifts taking place in our market. We are seeing more investors and families returning to our marketplace. The drop in our prices, while painful to sellers, has made our community more affordable to buyers. We are also seeing buyers with different “agendas” than before. Real estate is not the short-term money machine it was in the past. People are buying because they want the non-financial benefits that homeownership offers. They’re buying because they want to live in particular homes and build lives there. The amazing congruence of low prices and incredibly low interest rates is allowing people to recognize they can buy more than they could have in the past. They feel confident their purchases will make sense in the long run. They do not have the inflated financial expectations we had in the past. They are realistic about the costs, but prefer buying over the risks of renting. 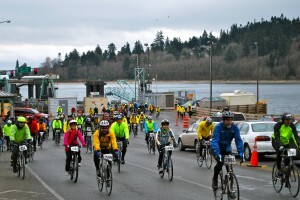 Cyclists unloading at the Bainbridge Island Ferry Dock. 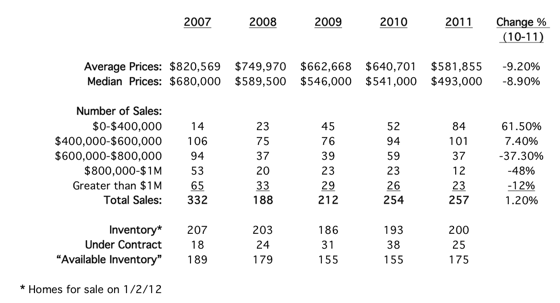 Settling into the reality of our new norm, we do not expect any substantial changes in our real estate market in 2012. But there is an underlying optimism. There are buyers. They’re patient, savvy and tough . . .but they do act when they find what they want. Many sellers have become more realistic and have come to embrace the current conditions, as painful as they may be. Our regional economy is strong. If we can keep ferry prices from getting to a point where commuting costs are unacceptable, there is no reason to believe we will not fare as well as any premium suburb of Seattle. And all the while we get to live in the best island community in the region. You will notice many similarities in the list of homes below. First of all, the majority of them sold very quickly, many in less than two weeks. Many saw multiple offers and many are homes priced around $500k. Many are close to the ferry with small lots. The long held idea of the “perfect home” has changed for many people. “Perfection” used to be much larger, cost a lot more and typically come with a lot of property to maintain. As we inch out of this recession many new definitions are being written and we see that clearly illustrated in many of the homes purchased in 2011. 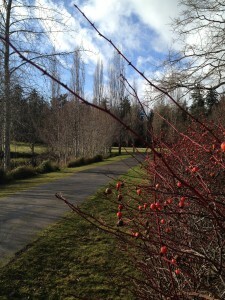 As we turn the page to 2012, “perfection” for more and people means less debt, less commute, less to maintain. Simple, really. In 2012 I expect to see even more buyers shopping for and buying homes that are smart, efficient and practical, yet still charming, special and inspired. Happy New Year – see you out there! This home caused quite a flurry. A flurry of offers. Eight total. This Wing Point neighborhood cottage designed by architect Roger Long is cozy, yet, bright and open. The garden is literally a work of art. The trend towards the “not-so-big” house and the proximity to the ferry made many buyers jump for the opportunity to live in this artistic in-town cottage for under $400k. Click here for a blog post about the Wing Point Neighborhood. Click here for homes currently for sale in this neighborhood. This home is in the sunny historic farmland area of Eagledale. This home and location oozes charm. Not a surprise weddings have been held on the property and for a buyer who wants old world charm in good condition, these homes are hard to find in this price point. Another unique opportunity. Click here for a blog post about the Eagledale Neighborhood. A home by this builder also made my Top 10 list back in 2008. 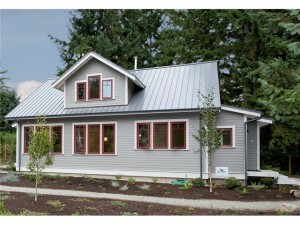 The Rolling Bay Land Company builds healthy homes and this one was designed by Studio Hamlet. The design is as modern as the construction is Green. From blown-in wool insulation to an 1,100 gallon rain cistern, this home is a smart collection of ideas, inspiration and innovation. And Green innovation at any price point is admirable, but for under $500k it list-worthy! Click here for information about the sister home, which is STILL FOR SALE. Click here for a blog post about the Rolling Bay Neighborhood. Click here and here too for homes currently for sale in this neighborhood. Another Wing Point home. 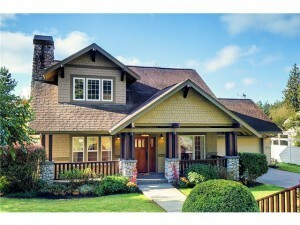 And another Craftsman style home. And . . . another home that saw multiple offers. Close to the ferry, on the Wing Point Golf Course and in an active price range. Warm woodwork and cozy spaces. 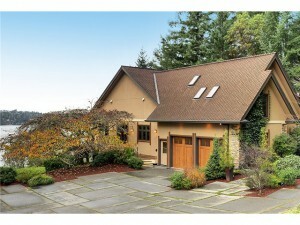 Although the home is just over 2,000 square feet, the finishes, quality, and location live large. This home has what many buyers consider the perfect package. It has two of my favorite amenities: a Mother-in-law space over the garage and walking proximity to schools. Quality woodwork and finishes with an open floorplan and just the right size at about 2,300 square feet. No surprise it lasted less than a month. Click here for a blog post about the North Town Woods Neighborhood. Click here for more homes currently for sale in this neighborhood. 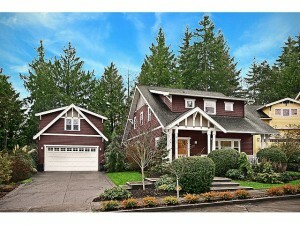 A sophisticated woodsy retreat near popular Battle Point Park. 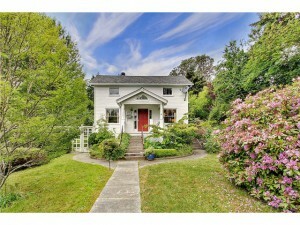 This home sold in the high $800k’s just a few years earlier. Deeded water access, a detached office connected by a breezeway, and a home with a smart floor plan, extensive woodwork with clever built-ins, fenced gardens. An amazing value. Click here for a blog post about the Battle Point Park Neighborhood. 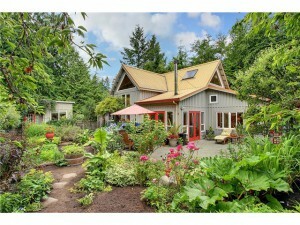 A home built by Bill Corbin was also on my list last year. Bill Corbin builds them fresh and modern with clean lines. 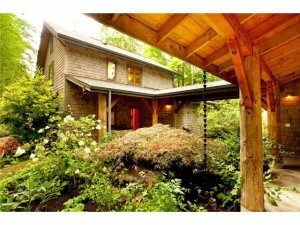 This home sits on five wooded acres – with trails and bridges. A brand new home with concrete counters in the kitchen and sleek modern tiles in the bathrooms. A large home in a retreat setting. Farmhouse perfection in Hidden Cove Estates. For someone looking for something a little different, this was it. Some homes look like farmhouses on the outside, then just have vanilla finishes. This home brought the classic charm of an old farmhouse inside with a quality distressed painted white cabinets in the kitchen, pine woodwork throughout the home, a sunroom and covered porches. I think this home tops the list for home I got the most inquires about over the course of the year. 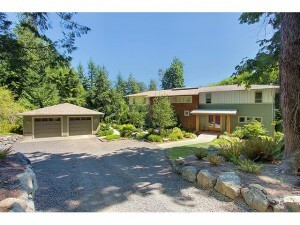 A large newer, waterfront home at this price-point drew a lot of attention. Warm Northwest Contemporary Style, high end finishes and western facing Olympic Mountain Sunsets made this a popular package. Pristine south end low bank waterfront. Walking out to the water on the backyard boardwalk, the grand view of Mt. Rainier, framed by watercolor landscaping is like instantly stepping into vacation mode. To think you could do that every day is pretty special. 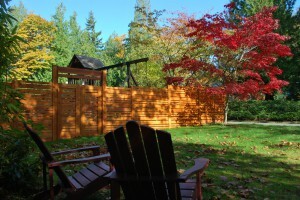 A guest house, main house, garden space, all set back from the road with a gated entrance. Privacy hard to find on Point White Drive.